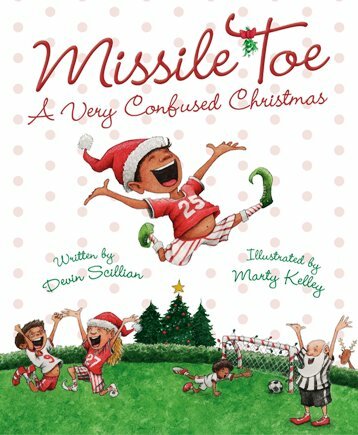 Christmas is known as “the most wonderful time of the year,” but thanks to author Devin Scillian’s new picture book, Missile Toe: A Very Confused Christmas, it’s also the funniest time of the year. In the book, Mr. Scillian revives the Christmas carols we all know and love…but with a twist. For example, in one passage, a child who has heard “The Night Before Christmas” one time too many implores Santa to leave him a box of delicious sugar plums — that mysterious treat that was supposedly so scrumptious that it danced in children’s heads. Another child contemplates the popular Christmas song, “Deck the Halls,” and wonders aloud whether the lyrics are referring to a deck of cards, the hall that leads to the bathroom, or the Hall of Fame. This book is brimming with “funnies.” Instead of the lines from the well-known carol, “As Shepherds Watched their Flocks by night,” children read how “wild shepherds washed their flocks by night.” Instead of a play about the city of Bethlehem, readers giggle at the antics of “Beth the Ham,” a little actor who loves to ham it up for the crowd. There are also poems like, “O, Holey Knight” (if you guess that this knight’s armor has holes in it, you would be correct); Round John Verjun (’round yon virgin), a jolly round guy who stands around smiling; and Johnny Oats Ate Nicholas (Jolly Old St. Nicholas), a poem about a greedy little puppy that eats everything that doesn’t eat him first. This is an adorable book that smacks of Mr. Scillian’s own unique brand of humor, and which could easily become a Christmas classic. Although the rhymes are sometimes just a tad off beat, Mr. Scillian’s unique ability to make the most common things funny evens everything out and leaves readers smiling long after the last page has been turned. Read this book to your early elementary classroom as you and your students count down the days until the Christmas break. It’s also a great introduction to humor, and can even be used as a writing exercise to show how the rearrangement or alternative spelling of a few words can change the entire meaning of a passage.